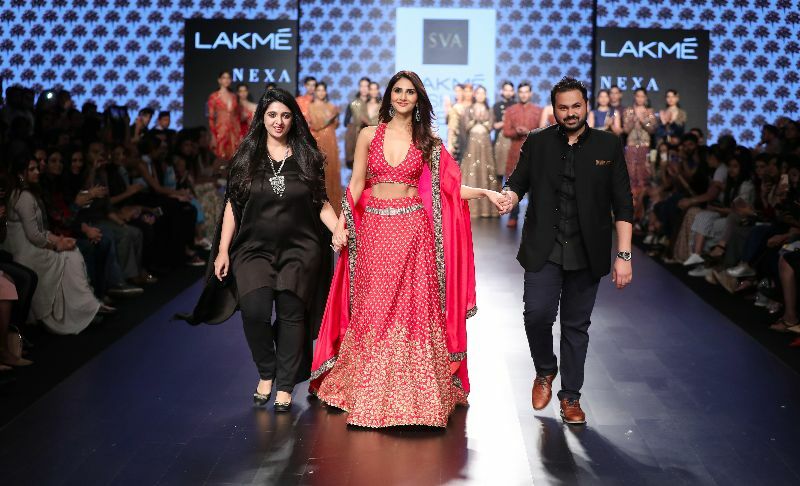 I finally have time to go through the Lakme Fashion Week Trends, and there is so much inspiration for brides to be. Today I am talking about SVA by Sonam and Paras Modi. the designer duo creates some amazing designer outfits in the 60k to 1.5 lakh range. So in case any of you have that kind of budget and are looking for new trendy Wedding Outfit Style, then this post will help you achieve that. Love this draping style. Sarees are so versatile, but sometimes we struggle on how to make it look stylish, modern and yet be traditional in our look. This one look just nails it. The gorgeous full sleeve heavy embroidered blouse goes beautifully with the otherwise plain printed saree. Don’t you love the look? Wedding outfits as is look really heavy. We are dressed in opulence from top to bottom, without any part of us going bare. This one look with a wee bit of cleavage looks pretty spectacular and cuts through all that wedding outfits drama. Quite a strong warrior look, isn’t it? I think this look is great for extended family members and for a sophisticated wedding guest look. Waist bands are trending in a big way, so this is a good style to keep in mind for future weddings. Taking a cue from the waist band trend and making it even more stunning, is this gorgeous blue lehenga that is perfect for your sangeet night. The draping style makes the whole look and feels fuss free and you can enjoy your night away dancing without worrying about your dupatta slipping off. While everyone is wearing a flared lehenga, you can choose otherwise and go for a A-Line Lehenga look with a jacket. The colour, the print makes the outfit look stunning and quite gorgeous. Belts on lehengas are trending, and this beautiful bright red outfit is my hot favourite in this collection. I have never been a fan of Vaani Kapoor as such, but this look makes her look her feminine best so far and I love it. Do you like the left or the right outfit more? I can’t seem to decide a favourite myself. So tell me in the comments which one do you prefer.